Eleuteri is recognized around the world as a leading source of and authority on rare jewelry and objets d’art. Father and son team Carlo and Wagner Eleuteri share a discerning curatorial eye for acquiring unique and important creations. These are some of the most memorable examples. A pair of cabochon ruby and diamond double clip brooches, circa 1960s. Formerly in the collection of Italian Dolce Vita actress Giovanna Ralli. 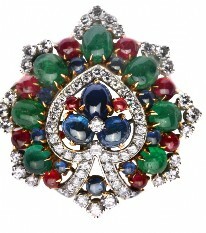 Iconic brooches, earrings, and rings in gold with cabochon emeralds, sapphires, rubies and diamonds, circa 1960. Serpent necklace/belt in gold with pink and white enamel, and pear-shaped sapphires. 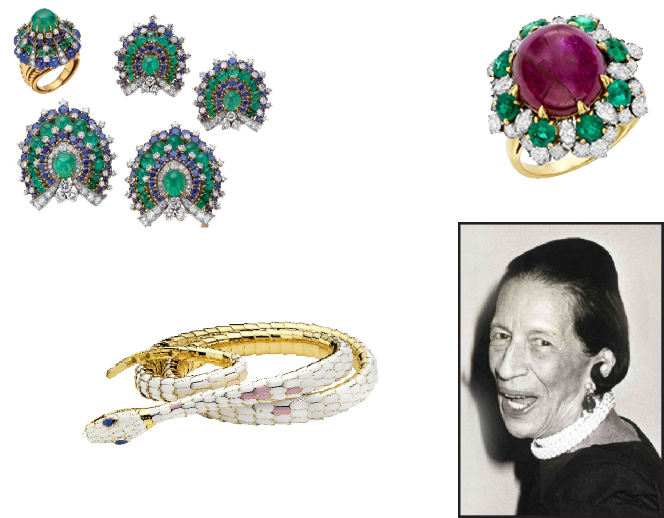 Formerly belonging to and commissioned by Diana Vreeland, circa 1970s. 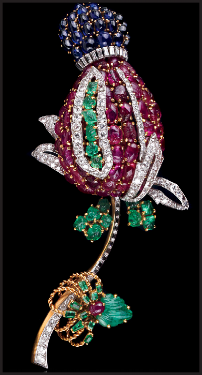 Exhibited in Bulgari’s international retrospective exhibitions. 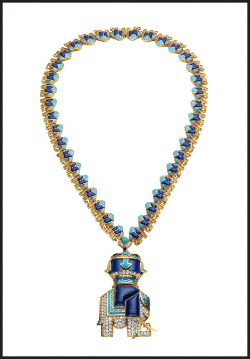 Lapis, diamond and enamel elephant necklace, circa 1970; formerly owned by an African royal family. 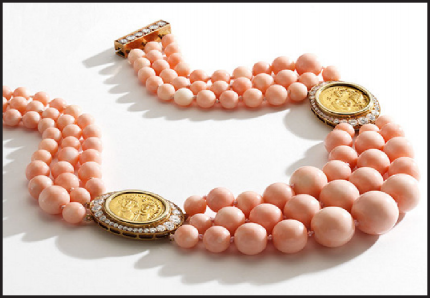 Exhibited in Bulgari’s international retrospective exhibitions. 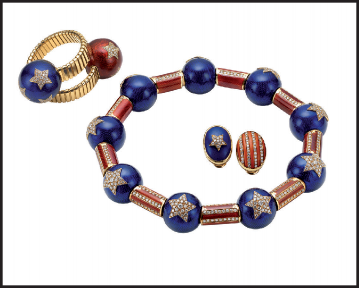 Rare set from Bulgari’s Stars-and-Stripes Collec-tion, circa 1971, to celebrate the opening of their first American boutique in New York’s Pierre Hotel. Yellow gold with red and blue enamel, lapis and diamonds, circa 1973. 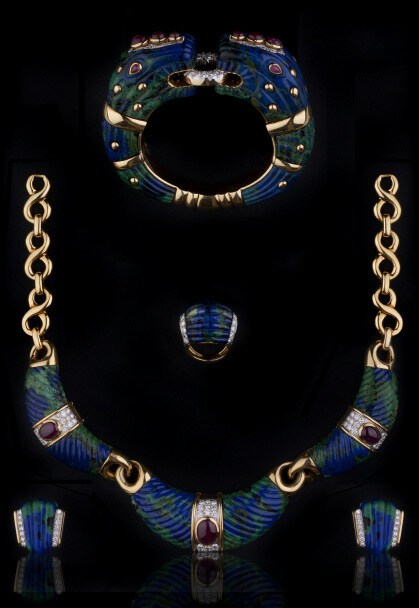 Exhibited in Bulgari’s interna-tional retrospective exhibitions. 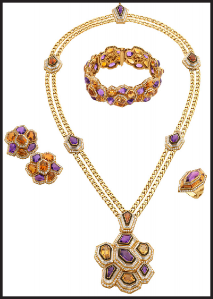 Parure of geometric design with amethysts, citrines, and diamonds, circa 1969. Exhibited in Bulgari’s international retro-spective exhibitions. 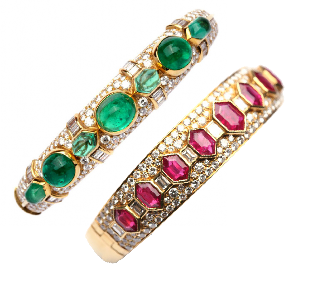 Bangle bracelet in 18kt yellow gold with cabochon emeralds and diamonds, circa 1970s. Ruby and diamond bangle of geometrical design, circa 1965. Monete evening bag in 18kt gold, embellished with twelve ancient Roman coins and diamonds, circa 1970. Exhibited in Bulgari’s international ret-rospective exhibitions. beads, gathered at the sides with two gold coins, “Heraclius & Heraclius Constantinus 610-641 AD Solidus,” and set with round diamonds, circa 1980. Exhibited in Bul-gari’s international retrospective exhibitions. 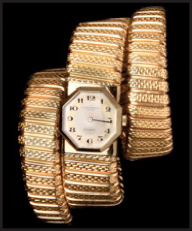 Tubogas watch bracelet with movement by Vacheron Constantin, “chicco di riso” gold work, and unusual central dial, circa 1960s. 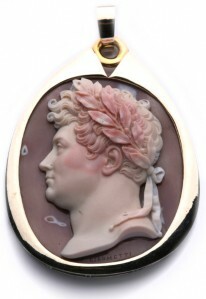 Large and fine agate cameo representing the profile of George IV, King of England. Engraved by Girometti, an esteemed Italian engraver, in 1825, remounted by Bulgari in the early 1970s. 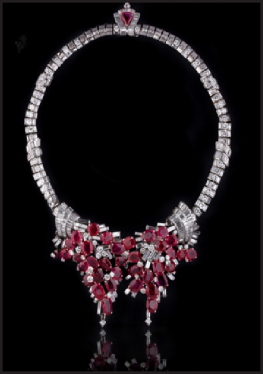 Exceptional necklace made with over 100 carats of natural Burmese rubies and diamonds, circa 1936. 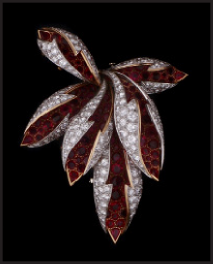 Intricate leaf-shaped brooch with rubies and diamonds, circa 1960s. 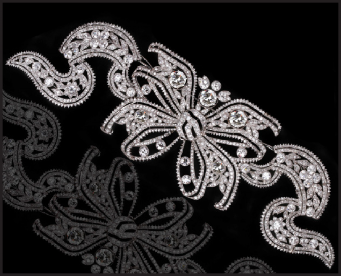 Unusually large and magnificent stomacher diamond bow-brooch, circa 1905. Large platinum and diamond Art Deco bracelet, circa 1925. 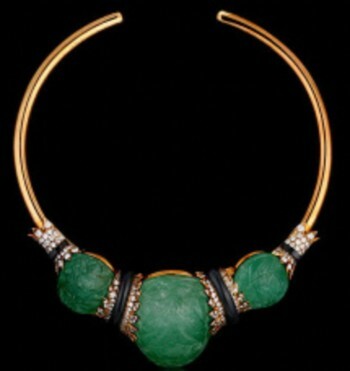 Choker necklace with large carved emeralds and diamonds, circa 1950s. 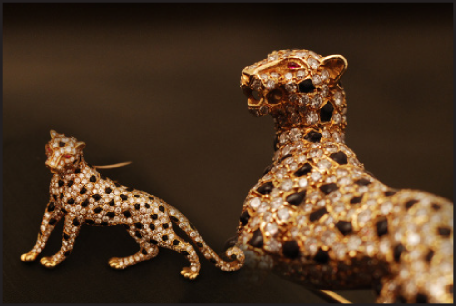 Unusually large version of the Everlasting Panther brooch, circa 1960. Tutti Frutti brooch representing a Cardoon plant, circa 1950s. 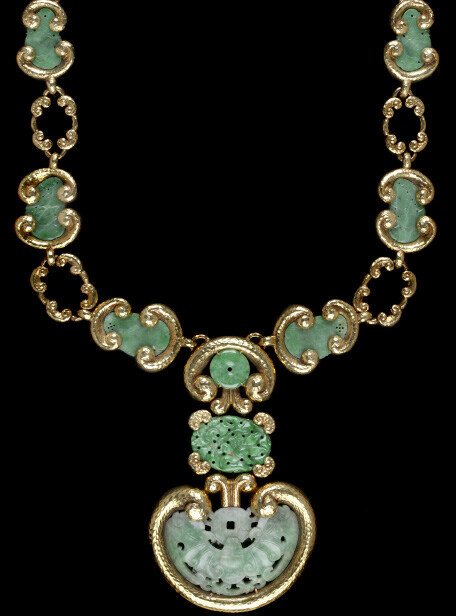 Long chunky carved jade and gold drop necklace, circa 1970s. 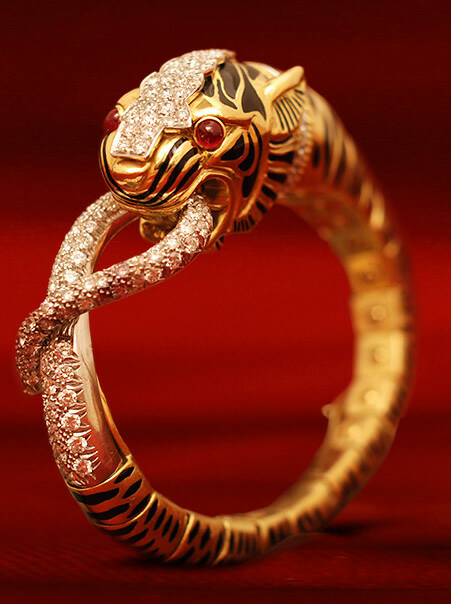 Tiger bracelet in gold with cabochon rubies and diamonds, circa 1970. Parure in azurmalachite with rubies and diamonds, circa 1960s. Cuff bracelet in platinum and carved rock crystal with pavé diamonds, circa 1975.